First page of "Dharma Bums." Editor's comments in pencil. 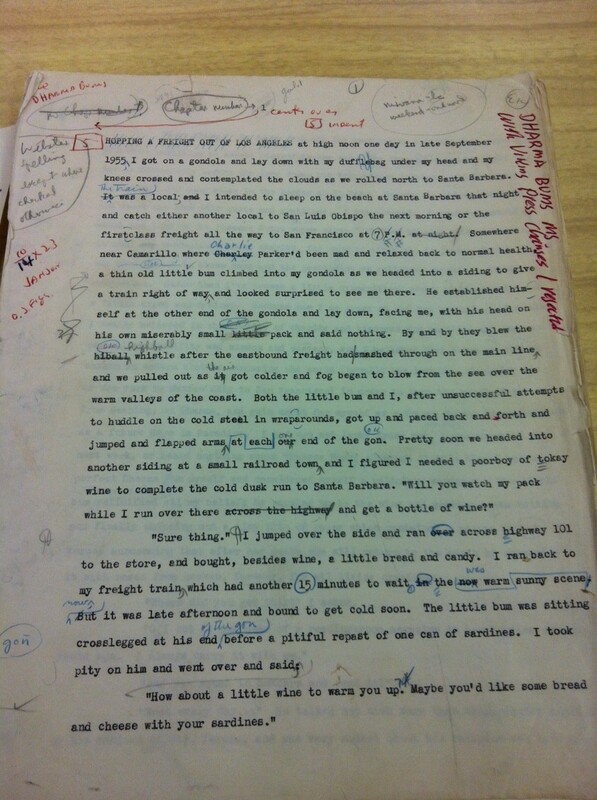 Kerouac's comments in red. Here’s a fun fact for you: when Jack Kerouac wrote Dharma Bums, he wasn’t touring the country or in a small apartment in New York City, he was living here in Orlando. My library actually has the original DB manuscript, edits and all. It’s really remarkable to see. What I found to be hilarious, though, was how Kerouac actually rejected most of the edits suggested. There’s actually a page where he wrote “Viking Press changes that I rejected.” How crazy is that! I’ve discussed earlier how I actually love getting critiques. Sure it hurts somtimes, but that’s good. Because I know the people who are editing are helping the book, not hurting me. And that’s my ultimate goal, isn’t it? I say all of this because…the editing phase is finally done on TNWSY. I sent out my first query yesterday. I’m nervous, of course, but also extremely excited. I know there will be rejections, I know there will be hard times, but I also know I worked hard on the book, and I’m excited that it actually turned into something. Something someone might see one day. I recently received my first rejection. It was bad but good as at least I knew I was submitting my work. Best of luck with it. Most writers get rejected tons of times prior to publication. So, just see it as one step closer to securing a deal! Good luck to you, too.